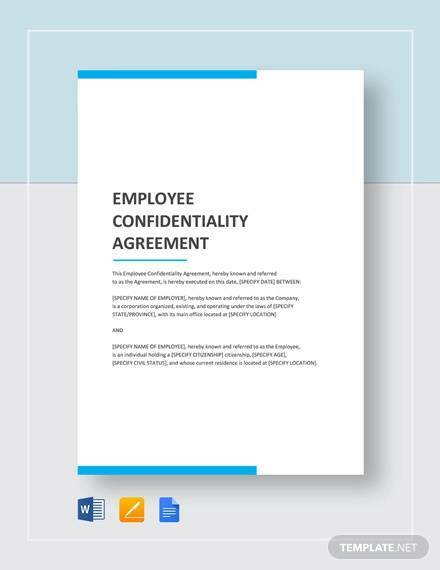 Employee Confidentiality Agreement is similar to nondisclosure agreement except for the fact that it is limited only to the employee and the employer. This type of legal contract has some important rules, terms, and conditions that restrict the employees from disclosing certain important information of the company till the time he serves the employment for that particular company. In some big companies, an employee is bound to be in the contract even after he leaves the job. 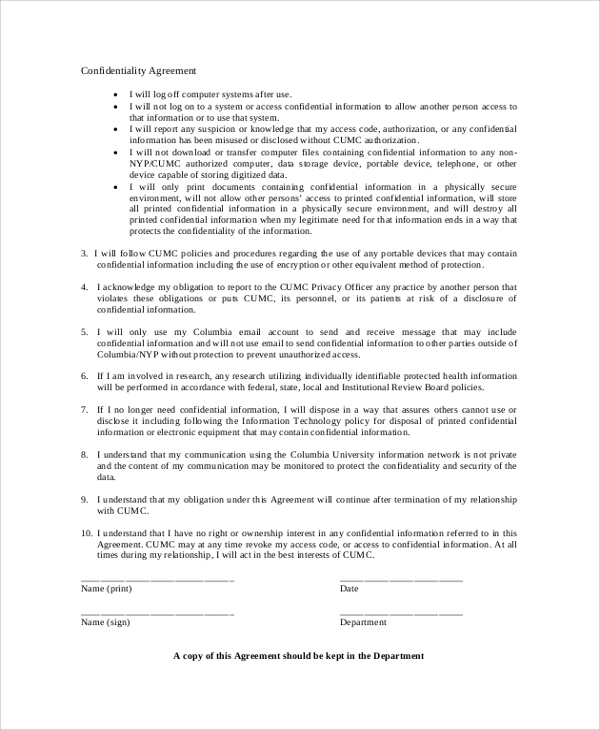 Such contract is similar to the sample Confidentiality Agreement Form but more or fewer changes are made in it. Standard Employee Confidentiality Agreement This type of agreement includes a simple employee’s terms and conditions for the betterment of the company. This agreement has all the information which an employee is not entitled to share while fulfilling the tenure of his employment. This type of agreement includes certain pointers which an employee needs to follow even after leaving a job. It may include the nondisclosure of information to the family and friends and strategic plans that were made when the person was actually working with the company. This agreement is designed in keeping the requirements of the healthcare department in mind. 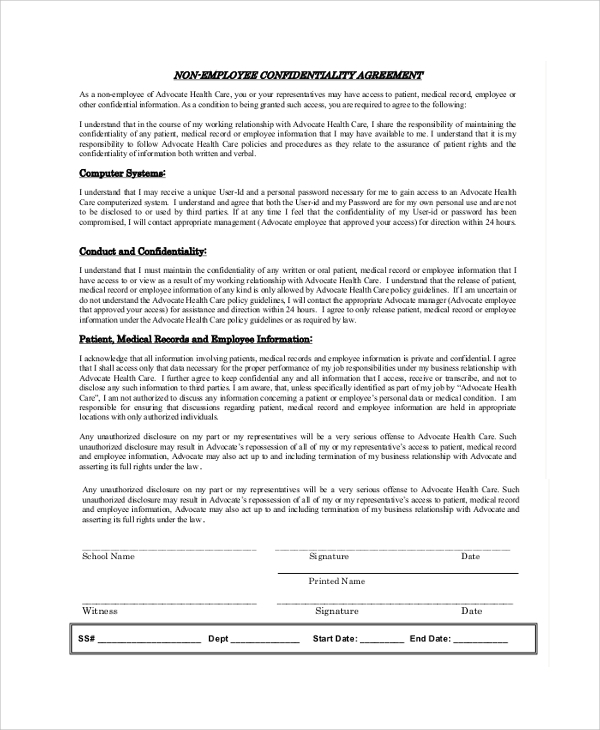 The name of the doctor, patient’s information, and other hospital details like accounts should not be shared by any staff member once the agreement has been signed. 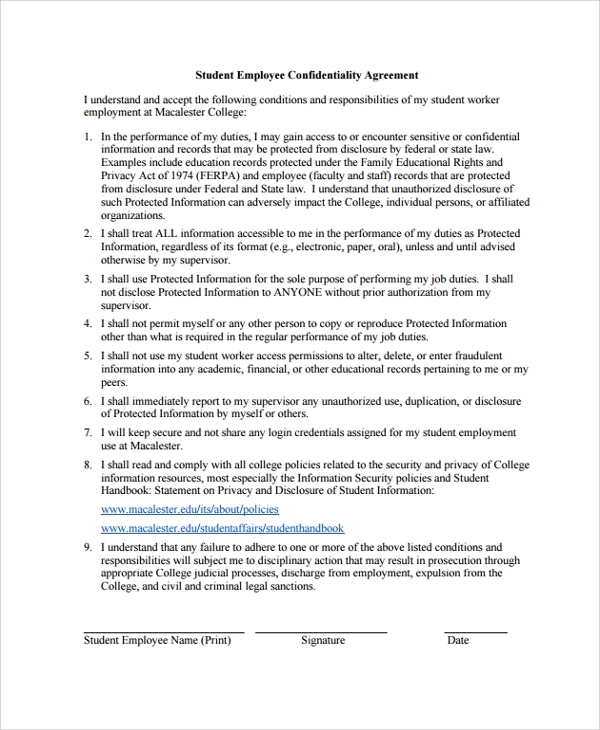 In this agreement all the information of the employee that includes salary, perks, and other benefits are not shared by the employer with any third party while employee agrees to the fact that no personal information of the company will be revealed outside. What is Employee Confidentiality Agreement? Employee Confidentiality Agreement is made to make few important pointers clear to an employee that the person is not liable to disclose any sort of information of the company anywhere outside. This type of confidential disclosure agreement includes certain activities that an employee is restricted from conducting. It also includes some important points which a company equally has to follow to protect the right of an employee. The lawyer advises the employee to sign this agreement before joining the company so that in case there is any kind of problem with the document, he can discuss the same and then come up with a conclusion. Such type of nondisclosure agreement is solely designed to protect the rights of the employer and the employee who come together to work on a business. 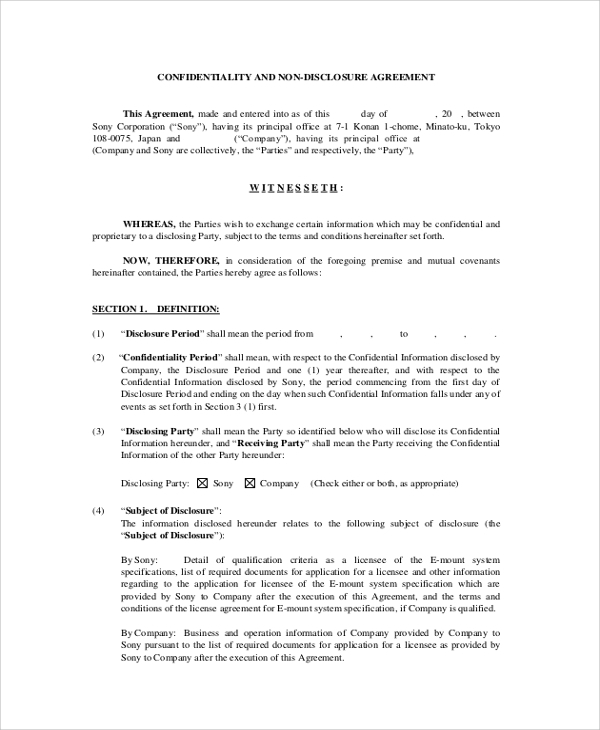 It is used at the senior level or the higher management level job interviews when the confidential information of the company is discussed and the candidate who has been chosen in the interview agrees to sign an agreement as an assurance that no information will be shared with any third party. Employers can avail the benefit of it as they can keep the parties restrictive about which information must be shared such as trade secrets, strategic plans, and the proprietary knowledge. How to Create/Write an Employee confidentiality Agreement? Employee confidentiality Agreement includes some necessary contents and agreement which states that an employee cannot disclose any kind of information with any third party which is related to the profit of the company. The agreement includes the time span during which an employee who doesn’t leave the employment shall not work for any other competition company. The agreement also includes certain pointers which an employee needs to follow even after leaving the company such as not sharing the strategies of the company to the competitors. 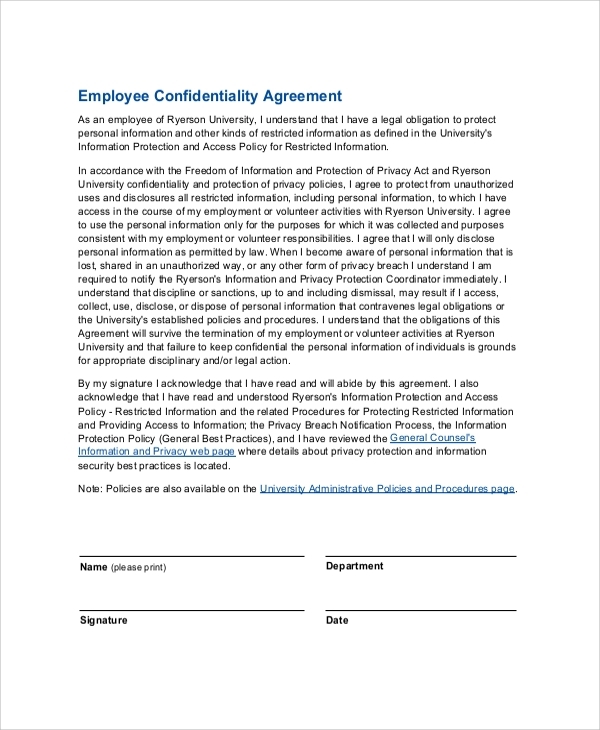 You may refer to sample Confidential Disclosure Agreement and understand what all information is stated in the employee agreement. Basically, with this type of agreement, a company claims the ownership of anything which has been written, developed, or produced as a result of the employment from the company’s business perspective in mind. The end of the agreement includes the time, date, name, and signature of the employee to whom this agreement has been made.